The first season of Enterprise sees ship and crew tackle the new, unfamiliar experiences of deep space exploration. Inexperience and primitive technology are repeated conflicts. A shadowing threat from the Suliban and related Temporal Cold War hangs prominent as the untested crew encounters such legacy species as Klingons, Andorians, and Ferengi for the first time, while reluctantly relying on the knowledge of their Vulcan science officer. En route to return a Klingon to Q'onos, Enterprise's maiden voyage proves more challenging than previous thought. Enterprise is in danger while it investigates the mysterious deaths of an alien crew. A landing party is infected with a mysterious illness, which causes delusions and mass hysteria. While on a repair mission, Tucker becomes pregnant with an alien baby. 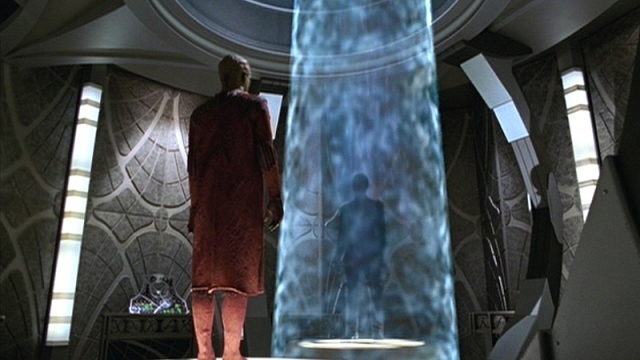 Enterprise investigates the fate of Earth’s first interstellar colony, whose inhabitants lost contact decades earlier. Enterprise visits a Vulcan monastary under siege by Andorians. The Enterprise explores a comet while a Vulcan ship observes closely. Enterprise examines the cause of a mysterious illness that’s infecting a primitive civilization. Enterprise encounters a damaged freighter whose crew is housing a sinister secret. Enterprise becomes front-and-center to the Temporal Cold War. The Enterprise rushes to install new phase cannons while under repeated attack by an unknown alien. Dr. Phlox assists with treatment of a planet-wide plague. An away team becomes stranded aboard a Klingon vessel that’s sinking deeper towards destruction within a gas giant. In the aftermath of the P’Jem monastery incident, T’Pol and Archer captured during an away mission. Seeing evidence that The Enterprise was destroyed, Tucker and Reed are stranded aboard a damaged shuttlepod. T'Pol engages in an invasive mind meld after Enterprise encounters a group of extremist Vulcans who embrace emotions. Enterprise discovers a group of hunters on a rogue planet. A group of Ferengi try to seize The Enterprise. Enterprise locates a crashed ship whose crew may be nothing more than ghosts. Archer and Mayweather are detained with a group of innocent Suliban prisoners. Several crew members are entangled in an alien’s web. Enterprise comes to the rescue of a revered Vulcan ambassador, whose life is in grave danger. Upon accepting a humble invitation, Archer and Trip are stranded in a desert after coming under attack. The Enterprise experiences an interesting vacation on Risa. The Enterprise is recalled after being suspected of destroying an entire planet.